Here is an interesting enterprise bordering on the bizarre: a famous violinist commissioning a full string orchestra arrangement of a string quartet that he has played many times in its original version. 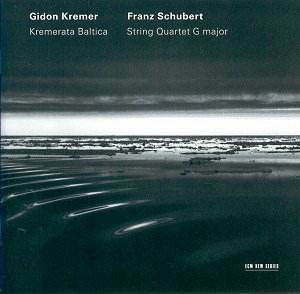 Maybe it is not so surprising when you know that the orchestra with which Gidon Kremer wanted to play the arrangement is his own eponymous Kremerata Baltica - formed in 1997. In the booklet he gives two reasons for the commission: first, to give his young players, selected from the Baltic States (Kremer is Latvian-born), a chance to "research the great masterpieces of chamber music", and second, to "illuminate the works I already know on a grander scale". Only the second reason is relevant to the listener and is the main, if not the only criterion on which to judge the project. Why Schubert�s G major Quartet? Here is a supreme masterpiece of chamber music that has never been played anything like as much as the earlier D minor "Death and the Maiden" and A minor "Rosamunde" quartets. Yet there are good reasons to give it the grand treatment for this is a big work. In the two years since Schubert wrote the A minor Quartet he had come a long way in his handling of sonata form, consciously adapting his style to Beethovenian methods. For example, in the A minor he plays to his strengths, opening with a long melody which, come the development section, he submits to little more than variation technique. In the G Major he starts with a dramatic introduction followed by a first subject characterised by a short rhythmic pattern. The same pattern is integrated into the second subject tune which is then extensively developed before we even get to the development section. The movement thus gains a breadth that derives from a sense of gradually expanding, powerful narrative underpinned by a repeating rhythmic cell à la Beethoven. The expansion is not only linear. Schubert also expands vertically by using more double-stopping (instruments playing chords by using more than one string) than in the earlier quartets. All this can lead to a temptation to describe the work as "symphonic", thus suggesting its suitability for orchestral treatment. Nevertheless, as I set out to play the disc, there was hovering around in my head the negative question, "What�s the point?" I got a shock straightaway. The first big chord (bar 3) echoed around as if in a large, empty church. I checked and this indeed appears to be the case � St Nikolaus in Lockenhaus. I never got used to the cavernous acoustic. The playing, however, partly offsets it by eschewing a fruity, vibrato approach and adopting a clean and lean style that is delivered with impeccable intonation. Kremer, leading from the front desk, has a clear idea of what he wants and his players deliver his interpretative mannerisms with exceptional, well-rehearsed ensemble. Not everyone will feel comfortable with the mannerisms though. There is, for example, some fiercely accented playing, but my biggest objection relates to tempo. Come the second tune of the first movement, Kremer slows down by a radical 15 to 20 %. He then winds the tempo back up as the tune is developed; this, in isolation, is exciting. But, in my opinion, such loss of momentum in the first place wrecks the movement�s sense of inexorable, organic growth. I suppose Kremer could argue that in Schubert�s day players might have been expected to slow for a new, lyrical tune and therefore it was not necessary to mark the score. I cannot believe that to be the case here. We may never know, but there is some circumstantial evidence to support my argument. In the very few works for which Schubert provided metronome markings, he does not give a fresh mark when it comes to sections equivalent to a first subject/second subject transition. There is some beautiful, beguiling playing in the slow movement but when it comes to the alarming passage where Schubert appears to grind two different keys together, the homogeneous nature of the string orchestra sound somehow takes the edge off the shock that a quartet can so often provide. The last movement is superbly executed, played with a Mendelssohnian, scherzo-like delicacy. But is that what the music needs? To me, Schubert has written an alarmingly jagged movement with its incessant rhythm and major/minor harmonic lurching. As for the orchestration, there is published in the booklet a fascinating exchange between the arranger, Victor Kissine, and Kremer over a number of technical issues. The correspondence reveals the philosophy behind Kissine�s overall approach: "my chosen idea (tutti >solos)". This means that he must have had in his head a concerto-like conception of the piece that some may think a perverse approach to the arrangement of this quartet. The result is that some of the main tunes are taken by soloists, relegating the rest of the parts to a subordinated, accompanying role. Gustav Mahler made an arrangement of the Death and the Maiden quartet, and although I do not have a recording to hand, as far as I recall he does not give any parts to soloists so the result sounds far more like a work that was written for string orchestra. It is clear that a great deal of effort went into the realisation of this project. So I did the decent thing and listened to it three times � some passages more � and started to get used to it, delighting in some aspects, usually in connection with the playing. But the question, "what�s the point?" remained, although I dare say that for some, Kremer�s intention may be realised: the "illumination" of a masterpiece already known. For me, the fact that the music stood up to some wayward arranging and interpretation proved what a robust work of art is Schubert�s last, great quartet.